Published on September 20, 2015 by Martyn. Be the first to comment! 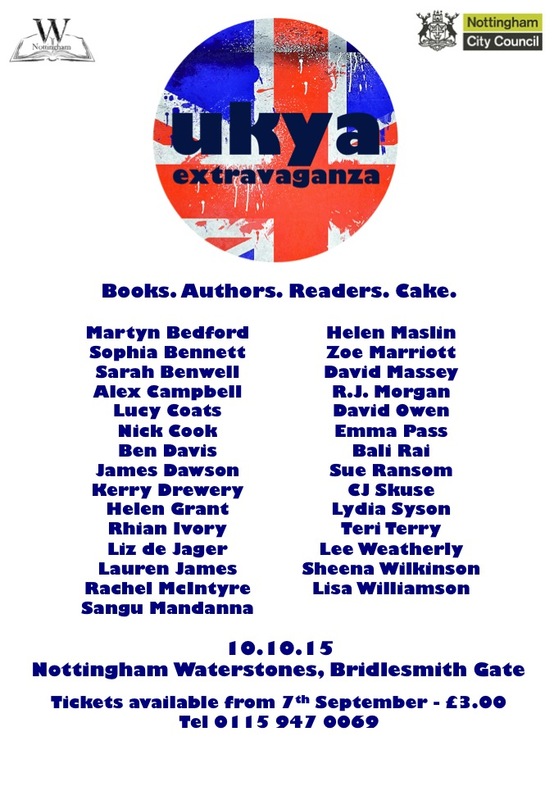 I’ll be celebrating my birthday in unusual style this year with a trip to Nottingham to take part in the second UKYA Extravaganza. I’ll be joining nearly thirty other British young-adult authors at the event, on October 10th, which will include quickfire panel sessions, book signings and plenty of time for readers and writers to mingle. For my panel, I’ll be sharing a stage with Liz de Jager, Sangu Mandanna and Sheena Wilkinson – each of us giving a two-minute presentation about ourselves and our writing, followed by questions from the audience. I don’t know the other three but I’m very much looking forward to meeting and working with them. Among the other authors appearing at UKYAX are Helen Grant, Rhian Ivory, Lauren James, Zoe Marriott, Bali Rai and Lisa Wilkinson. A rolling blog tour in the lead-up to the event is already underway – I’ll be making my virtual appearance on Mikayla’s Bookshelf on October 2nd. Tickets for UKYAX, priced £3, are available from the shop on 0115 947 0069. A second event, with a different line-up of authors, is taking place at Nottingham Central Library the following Saturday, October 17th. For more information please click on this link to the UKYAX Facebook page.